Hayley Kirkman and three other artists created the “Local is the Way” mural, which was unveiled Friday at Durango Joes on College Drive. The mural is the first public art project by Local First Creative Arts Initiative. A colorful mural celebrating Durango was unveiled Friday at Durango Joes on College Drive. It is the first public art display created by the Local First Creative Arts Initiative, which provides living wages to local artists, increases beautification efforts and helps to grow the arts community in Durango. “We want to work with local business to put up art, and pair artists with businesses,” said Hayley Kirkman, creative arts coordinator for Local First. “We set up boxes around town asking people to submit words describing what they love about Durango,” Kirkman said. Subtleties include a bear digging through a trash can, a nod to the ill-fated Arc of History – “may it rest in peace,” Kirkman said – and a brewery. 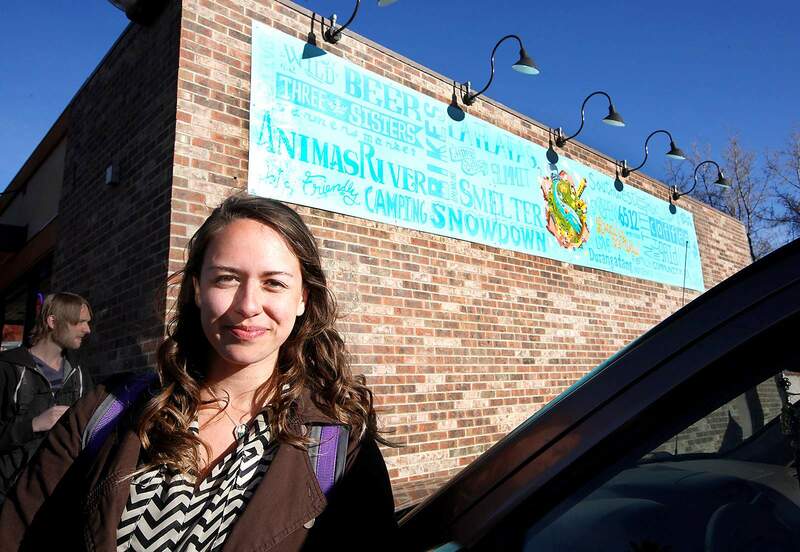 She said the coffee shop’s west-facing wall was the ideal spot for the mural because it will be seen by people driving to Fort Lewis College. Kirkman teamed up with local artists Sarah Sturm, Allie Wolfe and Dakotah Andreatta to create the mural over the span of about two months. The project cost about $2,000 and had sponsors including Durango Joes, Studs Lumber and FLC. “The goal was to raise enough money to pay the artists as well,” Kirkman said. The mural at Durango Joes is just the beginning of efforts to create thought-provoking and beautiful works of art visible from the streets. She said the Local First Creative Arts Initiative plans to apply for grant money through Durango Creates! for future projects. Through Durango Creates!, the city grants money to businesses, nonprofits and other groups that want to organize creative projects or events.